The 2014 League of Legends World Championship: A Seminal Moment in eSports history and how Riot is only just scratching at LoL’s potential. The Super Bowl. That’s what I thought I was watching at 2 am this morning. In the 2014 World Championship, League of Legends and eSports as a whole finally hadits seminal moment, and when it was over, I was speechless. The Super Bowl. That’s what I thought I was watching at 2 am this morning. In the 2014 World Championship, League of Legends and eSports as a whole finally had its seminal moment, and when it was over, I was speechless. I stared at a blank page for a long time trying to figure out how to form what I was feeling into words. The growth of League of Legends has been unfathomable. Three years ago, the Season 1 World Championship took place in a crowded convention hall, and in front of a thousand fans for $50,000 and pride. 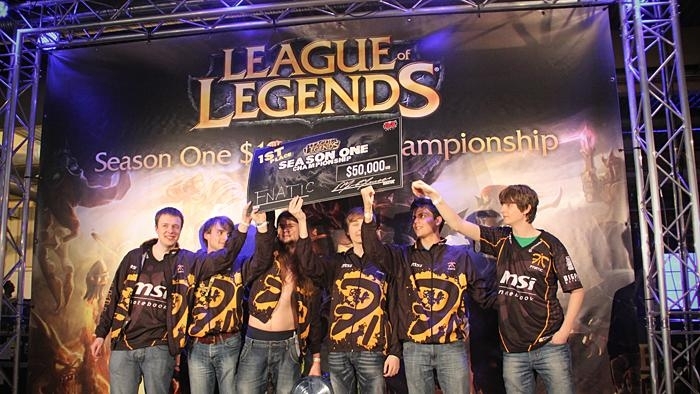 The Season 4 World Championship spanned countries, selling out larger and larger venues with each subsequent stage of the tournament, and the Finals being held in front of 40,000 fans at a former World Cup venue. It’s tough to get an early consensus on online viewership, but pretty much every source agrees that there were more than a million fans watching the english streams, and more than 2 million watching the chinese streams at any given time. The numbers are staggering, and are likely to only go up as more sources report their ratings. But the numbers don’t matter. League of Legends is not new to staggering numbers. Not when some 30+ million people play the game each month. The real story of the Season 4 World Championship was a sport coming into its own as a spectacle. I’m going to start at the end and head backwards. The biggest gripe with the Season 3 World Championship that Riot could control (it’s not their fault SKT1 steamrolled Royal Club) was the extremely brief Trophy Ceremony and the garb of the presenters. It’s safe to say that Riot fixed those problems. The Trophy Presentation was almost twenty minute long, with each player being announced individually before Marc Merrill, Brandon Beck and the head of Riot Korea (in Sports Jackets!) presented the team with the Summoners Cup. Afterwards, each player was given the chance to give a little speach on stage, and then allowed to hang around on the stage like rockstars greeting their fans as Imagine Dragons closed out the night with a set of their biggest hits. The rest of the production had all the hallmarks of a tradional Championship broadcast. The Analyst Desk segments felt like watching an ESPN round table, while the interviews throughout the show were well executed and informative. The English Casters were superb, as was Korea’s Legendary hype man, Jeon. The broadcast had everything you’d expect from a Super Bowl, and maybe a little in common with the Olympics. The Opening Ceremony was unexpectedly epic, starting with a montage of the World Championship so far as about one hundred performers on a variety of drums along with a complete orchestra performed on stage, culminating in Imagine Dragons taking the stage with their now trademark Bass Drum decked out in Ao Shin trappings (soon™). One can’t help but wonder what’s next. Is it too ambitious to imagine League of Legends selling out one of the 80,000-100,000 seat football stadiums when the World Championship returns to the US in 2016 (it will in all likelihood take place somewhere in Europe next year)? Perhaps on the East Coast, where fans have been begging for an event for years. I don’t think so. It’s hard to bet against Riot when you think about how far they’ve come from that crowded convention hall at Dreamhack Summer 2011, even if eSports overall popularity in the United States isn’t as high as in Korea. But just the gumption it would take to try is unthinkable right now. Even so, I can’t see the ceiling right now. League of Legends popularity is only growing. New Regions are rising up and showing they deserve a place on the world stage, servers are being built across the world to bring the game to millions of new players, and mainstream media coverage is gaining momentum. Major Corporations outside the Korean standbyes are beginning to see the vast opportunities eSports have to offer, sponsoring teams and players in a rush to appeal to their most profitable demographic. From a financial standpoint, things have only just begun. The elephant in the room is the potential merchandising jauggernaut that is League of Legends. Clothing, Action Figures, Board Games, Trading Card Games, backpacks, and plushies are just a taste of the potential products Riot could include in their upcoming Online Store, rumored to have over a million different items. Beyond that, Licensing opportunities for TV shows and Movies with a pre-established fan base are numerous and undoubtedly lucrative (especially considering the growth of the Chinese Film Industry). It’s only a matter of time before that money trickles down into the competitive scene, leading to bidding wars and seven-figure salaries as teams compete for top talent. Eventually, some control will be ceded to the players as they become Global Stars separate from the brand of their team, gaining the ability to negotiate contractual terms on an even footing. This is what I mean when I talk about potential. League of Legends may have had it’s watershed moment, but if the past is any indication, it only gets better from here.